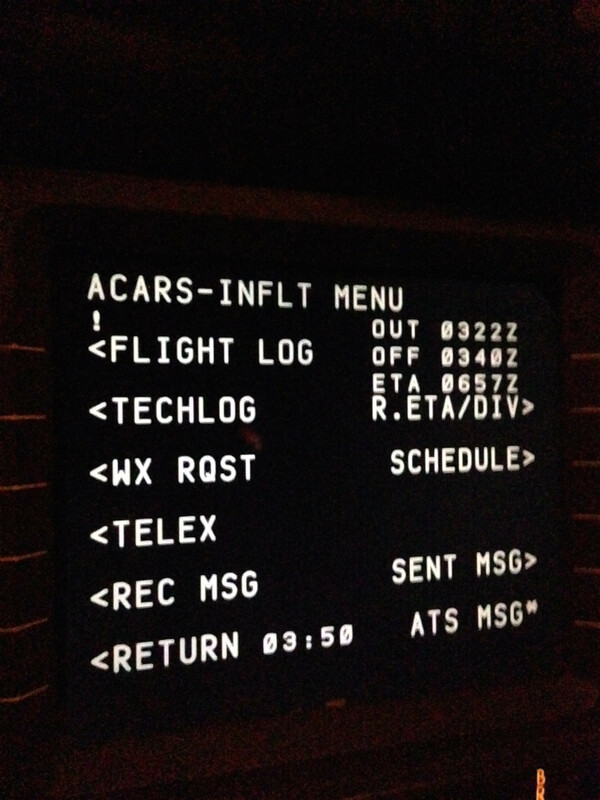 For a while now I've noticed an exclamation mark on the ACARS inflight page of the B737NG at the beginning of a flight. It is located in the top left corner of the page and it just disappears after a while. I've been searching high and low what it means but can't find it. Any ideas? Okay guys, the verdict is in. It is a symbol to indicate the crew alerting chimes are inhibited. From OUT (off block) until OFF+15 and estimated ON-10 until IN (on block) the chimes to alert for new data and messages are suppressed to avoid nuisance warnings during critical flight phases. Not the answer you're looking for? Browse other questions tagged boeing-737 acars or ask your own question. Why, after decades of redesign and enhancement, does it still rain inside B737? Does the Boeing 737 MAX use electro-hydraulic actuators? How long is the horizontal stabilizer on a Boeing 737? What happened to the Boeing 737.X design? Could you help me identify a sound that began before pushback? What is the maximum fuel amount that fits into the rare Boeing 737-700ER version?